Enter into this extraordinary residence to an impressive view of the grand staircase which is topped with a gorgeous skylight. As you continue into the home, your eye is then drawn to an inviting living room filled with natural light and charming architectural details. The handsome wood burning fireplace has an exceptional mantle made of reclaimed wood from the Plaza Hotel and single slab marble surround. Opposite the living area is a fully renovated chef’s kitchen outfitted with top name brand appliances including Sub-Zero, Bosch, & a gas stove by Viking. 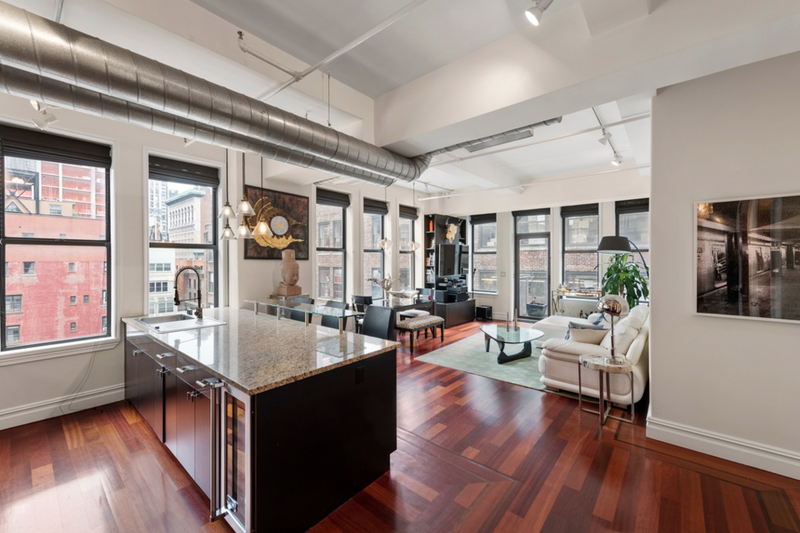 A palatial floor-through condo graced with a comprehensive collection of details and finishes, this 4-bedroom, 3.5-bathroom loft is a paragon of design. Features of this 4,017 sq. ft. home include gorgeous wide plank hardwood floors, huge casement windows with northern, southern, and eastern exposure, airy 11-ft ceilings, beautiful gallery-like walls, cast-iron columns, keyed elevator access, an integrated Sonos sound system, Lutron lighting, a convenient laundry and mud room, and a unique look-through gas fireplace. A stunning corner penthouse designed through a lens of Scandinavian elegance and functionality, this 4-bedroom, 3.5-bathroom home is a portrait of contemporary Brooklyn luxury. Features of this 2,321 sq. ft. apartment include French door-inspired floor-to-ceiling windows with northern and eastern exposure, gorgeous white oak floors, airy 9-ft ceilings, multi-zone heating and cooling, a convenient in-unit washer/dryer, and a private 1,061 sq. ft. terrace with charming neighborhood views. This bright open concept home is an entertainer’s dream with airy 11'' ceilings, oversized picture windows, Brazilian cherry hardwood floors, plenty of closet space, and a washer and dryer. Enjoy cooking in your open chef’s kitchen with Giallo Granite counters, bar seating, and top of the line appliances including a LG refrigerator, Kitchenaid dishwasher, Viking range, oven, and 24 bottle wine cooler. This sun-drenched corner one-bedroom, one-bathroom residence boasts walls of expansive tilt and turn windows, city views, upgraded appliances and finishes such as rift cut white oak hardwood floors and a custom marble Hearth Cabinet Ventless Fireplace. Enjoy your own private balcony off the living room with views of the Empire State building, custom built in closets for extra storage, and a vented washer and dryer. This smart home features Sonos speakers and a fully integrated Control4 brain that operates lighting, audio, custom automated shades, and central HVAC. A gut-renovated co-op graced with chic finishes and picturesque city views, this 1-bedroom, 1-bathroom home is a paradigm of contemporary city charm. Features of this 850 sq. ft. apartment include classic parquet floors, northern, southern, and eastern exposure, an extra-long living and dining space, and a quartet of large closets.